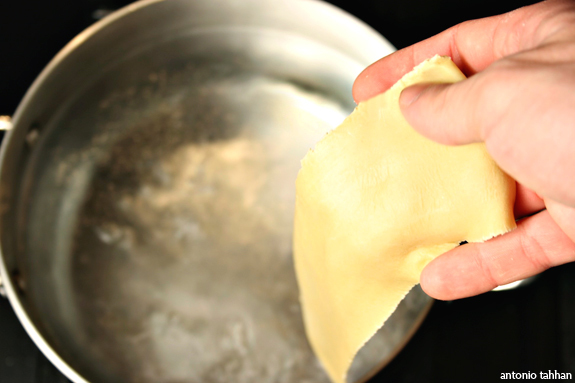 Cook flour in butter until mixture becomes pasty and begins to stick to the pan. Approximately 3-4 minutes. 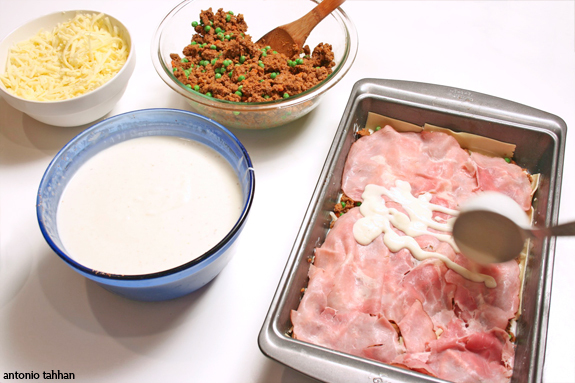 Slowly add room temperature milk while whisking the mixture so that you end up with a smooth sauce. Season with salt and ground nutmeg. 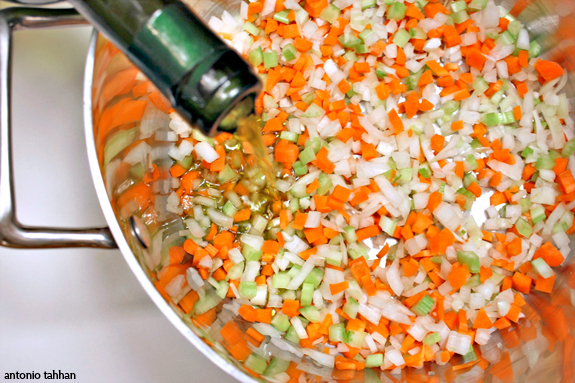 Sweat the onion, carrot and celery by cooking in olive oil over medium heat until they become translucent (approx 8-10 minutes). Move the softened vegetables to the side of the pot and raise the heat to high. Once the vegetables begin to sizzle, add the ground beef. Deglaze the pan after a few minutes with the red wine and stock. Stir in the remainder of the ingredients (except the frozen peas) and cook over low heat for a couple of hours (stirring every 30 minutes). Remove from heat, mix in frozen peas and set aside until ready to use. note: This can be done the night before and refrigerated until ready to use. Posted in entrees, Greek, recipe, savory by Antonio Tahhan on February 9th, 2009. You can follow any responses to this entry through the RSS 2.0 feed. You can leave a response, or trackback from your own site. I love this pastitso! What a fanatstic twist Antonio…I def need to get myself in on this event! absolutely gorgeous Tony! 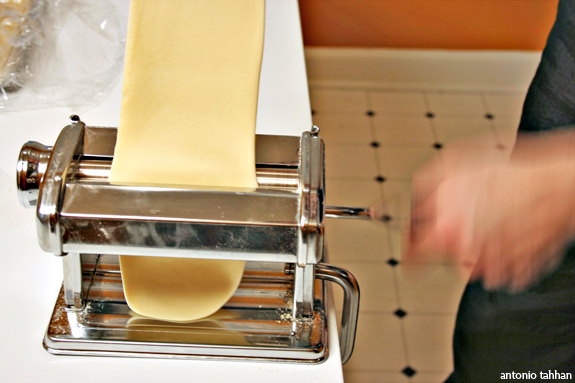 Pastitso is a time consuming dish in itself so kudos to you for making the pasta at home too! 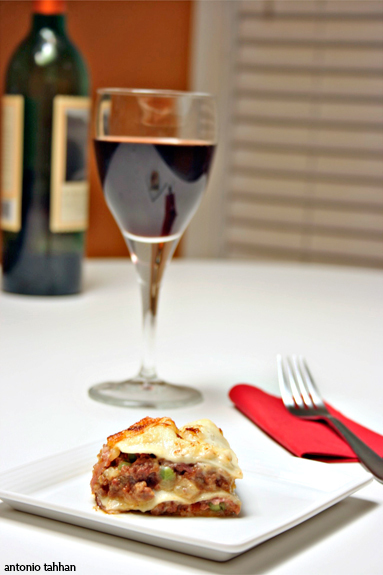 Tony, I too enjoyed my Pastitsio with a glass of fine red wine…a delight! Your creativity with the Pastitsio concept is what this event’s all about…vibrant, fun, delicious and new ideas…love to have a slab of your pastitsio! just saw this through Peter’s tweet, and looking forward to this event. Great dish. A great theme for your very fun Greek event! And you’ve started it off just right! I’ve got my pastitsio thinking cap on and will try and come up with something worthy of your lovely website. I’m thrilled to have won the tart challenge! I’ll have to get my Greek father in law to part with his pastitsio recipe. It’s not something I’ve made before. Your’s looks wonderful and I really like the idea of having the spicy harissa in it. 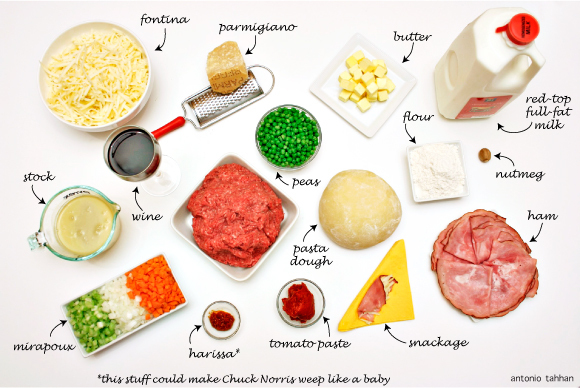 Tony, I am so happy I found your blog, it is beautiful, I love how you display the ingredients first. I never made pastisio before, looks great. Aw, I had planned on making a tart for this event, but totally lost track of time and missed the deadline. Oh well, your twist on pastitsio certainly looks interesting… I wonder if I can get my act together and submit something for this new theme! Beautiful, this is a perfect meal for a week-end with lot’s of wine. 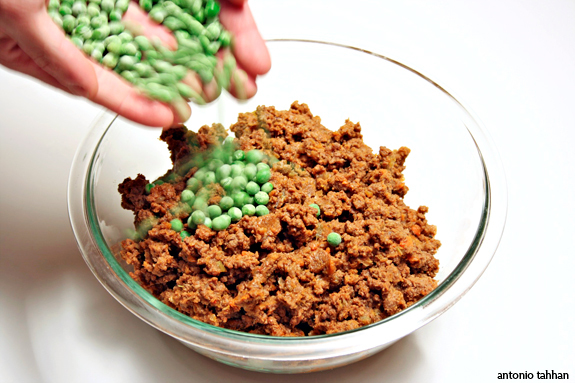 Why has it taken me this long to find this blog and how ever did you make peas and raw ground meat look so beautiful? I’ll find you on Twitter and plan to visit often and test out some of these delicious sounding recipes. Thanks! I don’t know what this is, but it sure ain’t Pastitsio. But you already know that, don’t you? Yummy Tony, this looks great and your photos keep getting better and better! 🙂 Nice job! That’s one gorgeous pastitsio! Love Greek food so I know I will love seeing what pastitsio versions this round brings! Your recreation of the Pastitsio is great! Looks so delicious! Sounds like a great event – and your dish looks heavenly! It always astonishes my just how much of a difference it makes to a ragu to cook it slooooowly. Another beautifully done post. Bravo! A great interpretation of Pastitsio and the last picture is sooooo cool!